The Smart Medical Bracelet | OhGizmo! By awesome on 08/14/05 • Leave a comment! 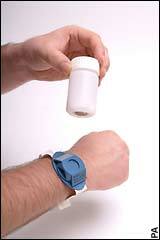 Much like military ‘dog tags’, the basic principle of a medical bracelet is identification. Claire Dunne, who hails from London, England has found a way to make that identification tool even more useful: it will help save lives (and malpractice lawsuits) by preventing medication errors. Claire’s university project turned into a medical innovation and won her a prize in the Reliance Awards for Innovation and Enterprise when presented at the Brunel Design Show in 2005. A prototype has been tested successfully, and I am sure this is one innovation that will eventually make it to market. No idea what the cost would be, but it would definitely be more than what it would cost not to make!